V, I’ll call him. Read carefully because you may meet him one day too. The first time I met the man, I just knew there was no way on earth I could like him. He is a very set in his ways elderly man working as an advisor for the company I am employed by. You understand what that means? He is paid a lot of money to find everything that I am doing wrong and then advise the company on how badly I’m doing it and then of course how much better his way is. His paycheck depends on my failures. His first words to me were, “Who are you?” You would have to catch my tone to grasp what my ears heard. Months into this process, I became tolerant of V, but by no means does this mean I took a liking to him. Earlier this week I encountered what is becoming a regular day at work. Grueling. Orders were not being delivered on time, paperwork was stacking up, and I was catching grief from both ends of the food chain. The thought ran through my mind that this job was not worth all this (actually, more than once). I really began to seriously consider my options. Then V walked through the door. This was surely the last straw. If I thought the day could not get worse, his arrival was surely evidence that it could. Rather than speak as I expected, he reached in his pocket and pulled out a gift… for me. It was his reason for coming to my office; to bear a gift. 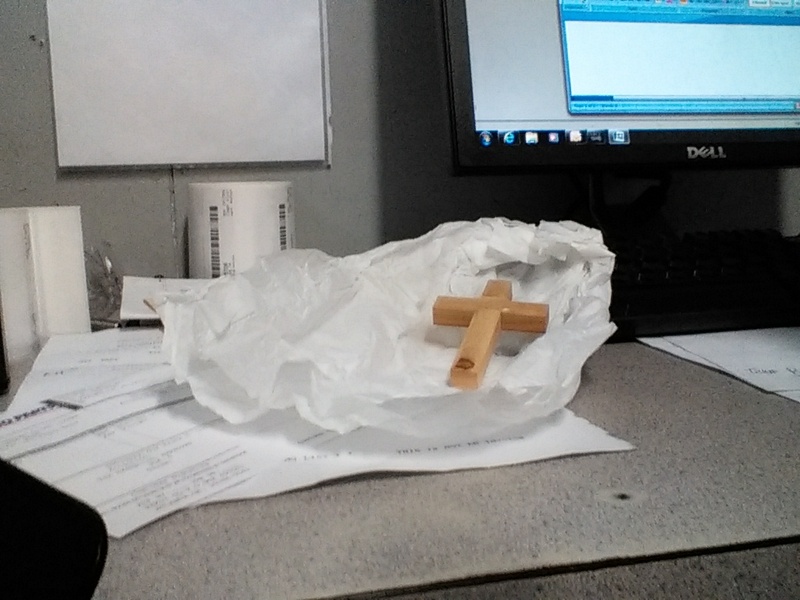 His gift was a cross made from an olive tree in Jerusalem. Traveling Israel, he thought enough to bring me a gift; a gift for a selfish scoundrel consumed by self-pity. Even though it was very difficult to show gratitude when I’d been so recently ungrateful, I thanked him while fighting back the tears forming behind my glasses. My countenance was rocked. V’s gift changed my entire outlook on my job and my day. The Cross has that effect, doesn’t it? V is still finding everything I’m doing wrong, but my appreciation for, and now my conversations with V are radically different. We have the greatest common link in the universe, and that link is Jesus. V calls me his fellow Christ-follower. A thousand lessons have battered me with this relational mishap (on my part), but the one that motivates me most is the thought that I had written someone off as beyond the pale; someone to not even attempt to engage with, only to find him ministering to me. Praise the Lord, V is a faithful believer who knows the benefit of the Cross… and acts on it. The Cross; its message is timeless; its reach endless; its ability to stop a wicked heart (like mine) in its tracks unrivalled; the Cross that bore the bruised, beaten, and sin-stained body of my Lord and Savior; the stains that were mine, like those I was guilty of just moments before V’s gift. This entry was posted in Christians at Work and tagged blogging, Christian, Christianity, faith, gospel, inspiration, missions, Religion and Spirituality. Bookmark the permalink. God is so marvelous MT. He placed V in your life, against your will, and V’s too, I’m sure. The effect you had on each other from your first encounter until the time you received the gift, all negative…but Father used it to bring humility to you, opportunity for V to give to someone he obviously respects and admires, (that’s you MT), and glory to Himself through your testimony. A perfect trifecta! We may never know the impact our life has on everyone we meet, good and bad. What a mighty God we serve! Gracious and encouraging thoughts you offer Keith. Thank you good friend… you are a treasured blessing. This reminded me of the contractor that worked on our house a few years ago. God used him to teach me a lesson on judging others before we really know them. A lesson I will never forget. Not sure if you read the article but here’s the link. http://drusillamott.wordpress.com/2011/07/29/god-is-in-the-reasons-why/ God bless. Thanks Drusilla… and very good to hear from you good friend! Not really sure what is up but WP dropped your comment into the spam folder, and I haven’t had time to go there and weed for a while. We’ll indeed check out your post. Thanks and many blessings! Thanks for stopping in and reading the post. It seems there are a lot of problems with WP lately. I have been having major problems clicking the like button on quite a few sites, this one included, and have even had problems leaving comments. And I have some readers that their comments always go into my spam folder, even though they have been commenting all along. Good to get re-connected. God bless. Love the quote! Amen! We will do well to remember Mr. Murray’s words as we minister to others today. Thanks and many blessings. Thanks! And yes, you are very right… you never know. It never ceases to amaze me how our Heavenly Father, in His sovereignty, bring people and situations into our lives as His adopted children that “teach us lessons we must learn”. Thank you so much for your honesty and sharing this beautiful message. Thank you for your warm and gracious words good friend. Many blessings to you today! Lovely post. God speaks to us in congruous ways. May we all have a “V” in all our lives. That, my friend, is a truly amazing story. It’s hard, but glorious, when God humbles us like that, isn’t it? Blessings to you! You are so right Jeff (hard… but glorious)! Thanks and many blessings Brother! This is a powerful testimony..and a beautiful picture of The Lord giving grace to the humble. Sometimes we are not in a position to be graced because we are not in a posture of humility. Thank you for sharing this humbling experience…the message reverberates in many areas of my soul. Thank you for being gracious good friend. Your encouragement reverberates here also… greatly.